A discrete and effective way to soften wrinkles and facial folds to rejuvenate your beauty. Dermal fillers help to replace the hyaluronic acid your skin has lost. The best part: Everyone will notice… but no one will know! JUVÉDERM® XC is the first only non-surgical hyaluronic acid filler FDA-approved filler made to instantly smooth moderate to severe wrinkles around your nose and mouth for up to one year with optimal treatment. Our skin changes as we age. Over time, wrinkles and folds form and the natural volume of youthful skin begins to fade. However, this can be prevented with JUVÉDERM® XC, a “next-generation” dermal filler. This smooth consistency gel aids in restoring your skin’s volume and smoothens facial wrinkles and folds. It helps get rid of “smile lines” and “parentheses” (nasolabial folds – the creases that run from the bottom of your nose to the corners of your mouth). JUVÉDERM® XC is made of hyaluronic acid, a naturally occurring substance in your skin that adds volume and hydration. Hyaluronic Acid is a naturally occurring agent found on your skin. As you age, you start to lose hyaluronic acid, which causes the skin to lose structure and volume, contributing to the formation of wrinkles and folds. Juvederm™ is eased under the skin to provide a smooth, natural look and feel that everyone will notice. Unlike conventional volume replacement techniques, the ArqueDerma® technique utilizes JUVÉDERM® XC as strategic relocation vectors to redistribute and direct the patient’s own tissue toward the facial hollows that have formed. 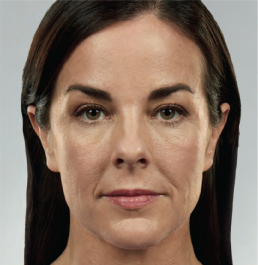 Using the ArqueDerma® technique, our RN collects facial volume that has dropped downward and artistically redirects it to create a more youthful, aesthetically pleasing look that reveals and embellishes your natural beauty. JUVÉDERM® XC injectable gel is the first Hyaluronic Acid dermal filler that has been FDA approved and is proven to be safe and effective for persons of color. JUVÉDERM® XC has been tested on both female and male patients and all skin types, so everyone can enjoy the benefits. The injection process takes about 45 minutes and results are immediate. There’s virtually no downtime following the treatment. Are there Other Dermal Fillers Available? Yes- Voluma, Radiesse, Restylane, Restylane Lyft, Belotero, and Sculptra provide additional options. Ask which option is best for you.